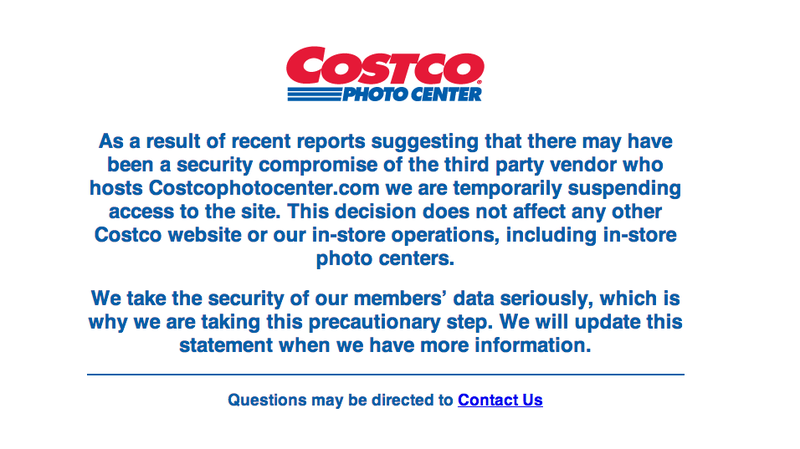 Costco, along with Rite Aid, Tesco and Sam’s Club, have suspended their photo center websites after a third-party vendor announced it was investigating a possible data breach. Less than a week after CVS took down its CVSphoto.com site while it investigates a possible credit card breach, at least four other retailers including Costco and Sam’s Club have suspended online photo services following notification by the company that manages or hosts photo services for the sites of a possible data breach. Reuters reports that shortly after third-party vendor PNI Digital Media – which is owned by Staples – announced it may be the latest victim of a hack, several retailers in the U.S., Canada and the U.K. temporarily shut down their photo sites. The retailers – which also include Rite Aid and Tesco – say they either took action after being notified by Canadian-based PNI of the possible breach or after hearing reports from other retailers. Costco and Rite Aid tell Reuters they made the decision to halt online photo operations out of an abundance of caution, as PNI has limited access to customer information since credit cards are not processed. CVS and Walmart Canada – which took similar action two weeks ago – advised customers to monitor their credit card transactions for any unauthorized charges. All of the retailers who have halted online photo services say their other websites aren’t affected by the possible hack. Staples acknowledged on Monday afternoon that PNI was investigating a potential credit card data security issue, but declined to specify how many companies were affected. “We take the protection of information very seriously. PNI is investigating a potential credit card data issue, and outside security experts are assisting in the investigation,” Kirk Saville, vice president, global communications at Staples Inc, tells Reuters.